Who will deliver autonomous vehicles to society? It will take the best and the brightest. 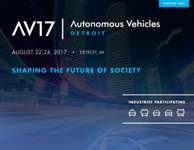 They meet and collaborate at Autonomous Vehicles – Detroit 2017 taking place August 22-24.